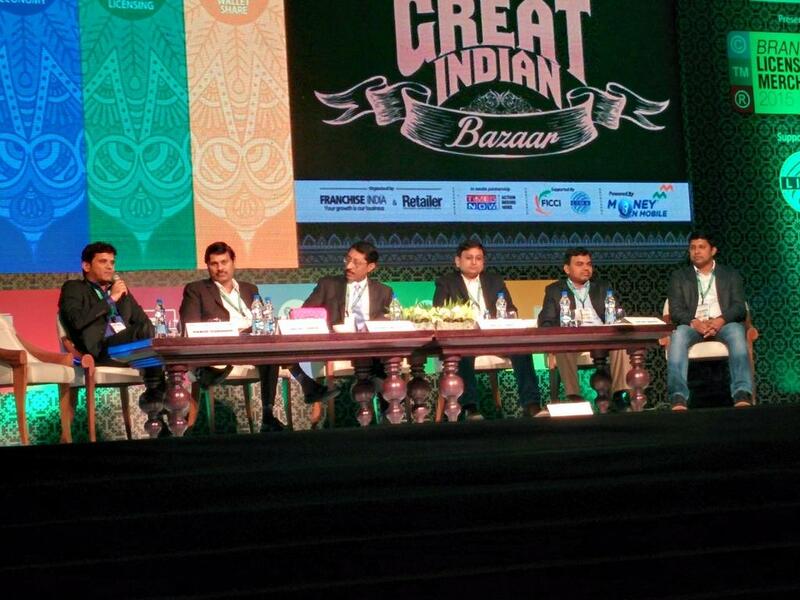 Panel Discussion moderated by Mr. Devangshu Dutta, Chief Executive, Third Eyesight at the Indian Retail Congress 2015 (17-18 April 2015). The panel included Mr. Manish Mandhana (Managing Director of Mandhana Industries with the brand Being Human), Mr. Sanjay Warke (Country Head of Toshiba India), Mr. Tanmay Kumar (Chief Financial Officer of Burger King India), Mr. Kinjal Shah (Chief Executive Officer of Crossword Bookstores) and Mr. Ranjan Sharma (Chief Information Officer of Bestseller India, with the brands Vero Moda, Only, Jack & Jones). 2013 has been a mixed year for retail in the Indian market with multiple factors working in favour of and against the business prospects. Economic growth had slowed to 5% for 2012-13 (as per advance estimates by The Central Statistics Office, Government of India), down from 9.3% in 2011. The ray of hope is that the growth rate is expected to rebound to 6.8% in 2013-14. Spiralling inflation, with prices of some basic vegetables shooting up almost eight to ten times, distracted the consumers from discretionary spending. The year hardly saw irrational expansions by retail businesses as they primarily focused on bottom line performance. While the Government of India liberalised Foreign Direct Investment (FDI) policy in retail in September 2012, international investors have been slow to respond and sizeable foreign investments have been announced only recently at the end of 2013. The political environment also took unexpected turn with the success of Aam Aadmi Party (AAP) at the Delhi Assembly Elections held towards the end of the year. This may augur in a new era of politics driven by performance and results but in the short term it could restrict market access for international multi-brand retailers, as the AAP has declared their opposition to investment from foreign multi-brand retailers. So is India still a strategic market for international fashion brands to look at? India’s Foreign Direct Investment (FDI) policy has come a long way with foreign investments now being allowed in multiple sectors including retail, telecom, aviation, defence and so on. The Indian government is now exploring the possibility of allowing FDI in sectors such as railways and construction. The year 2006 was a significant year for international brands in fashion and lifestyle space as the Government of India allowed up to 51 per cent foreign direct investment in the newly-defined category of “Single Brand retail”. In September 2012 the Indian Government liberalised the retail FDI policy to allow foreign investment up to 100 per cent in single brand operations and up to 51 per cent in multi-brand retail albeit with certain conditions related to the ownership of the brand, mandatory domestic sourcing norms for both single-brand and multi-brand retailers and additionally certain investment parameters for the backend operations of the multi-brand retail business. The idea was to attract foreign investment in retail trading a part of which could flow into improving the supply chain while providing Indian businesses access to global designs, technologies and management practices. The investments flowed in slowly initially. Some of these have looked at converting existing operations, such as Decathlon Sports which was present in India through a 100% owned subsidiary in cash and carry business. The brand is converting its cash and carry business in India to fully-owned single brand retailing business. But there have been some significant moves as well. A record breaking FDI proposal in single brand retail is the Swedish furniture brand IKEA’s, that had to apply three times since December 2012 before its’ proposed investment of €1.5 billion (Rs. 101 billion) received the nod from the Government. However, the proposal is reportedly still in the works, as Ikea looks to structure the business to comply with the laws of the land. And as the year came to a close the Government cleared Swedish clothing brand Hennes and Mauritz’s (H&M) US$ 115 million (Rs.7.2 billion) investment proposal. According to news reports the brand had already begun blocking real estate with the goal of launching its stores in India at the soonest. While the initial response to the relaxation of FDI policy spelt positive inflow for single brand retail, there was no new investment forthcoming in multi-brand retail. The existing foreign multi-brand retailers present in India through the cash and carry format showed a marked lack of interest in switching to a retail business model. On the other hand Walmart, the only foreign multi-brand retailer having access to a network of retail stores through its wholesale joint venture Indian partner, Bharti Enterprises Ltd., ended its five year long relationship and has restricted itself to the wholesale business. Though the company cited that it was disheartened by complicated regulations, it was also caught up in its own corruption investigation as well as allegations that it had violated foreign investment norms. The sole bright spot was the world’s fourth largest global retailer Tesco proposing and getting approval for a US$ 115 million investment into the multi-brand retail business of its partner, the Tata Group. At the time of writing the precise scope of this investment remains unclear. If you want the full paper please send us an email with your full name, company name and designation to services[at]thirdeyesight[dot]in. India’s Luxury Love Affair: It’s Complicated! Luxury is an ill-defined concept. There is no specific line or limit of price, quality or availability that separates the luxurious from all that is not. However, like other similarly intangible attributes such as power or grace, we all immediately recognise luxury when we experience it. In fact, experience — vague as that may sound — is key to differentiating luxury, more than the tangible product being consumed. It’s not just the person’s own direct sensory experience, but also the prestige and status granted by others around her or him that creates the luxury experience. Surely, with such intangible notions of experience, power and prestige, luxury brands should be among the most influential in the market. They should be pioneers that set the tone for change in improving retail management practices, upping customer service standards, driving quantum leaps in quality. But is it so? The response from the rest of the retail sector may not quite be “meh”, but I suspect that it would not be far off. There are strong reasons why luxury brands would have a lower influence as benchmarks in India and why, in fact, they may draw in more influence from the market themselves. As an example, in physical presence, luxury brands seem to demonstrate a delayed response to changes in the market, both in terms of market entry and location selection. Prior to the entry of global brands, luxury products and services in India were naturally defined by niche, largely owner-managed businesses. Business scale was curtailed by internal limitations, and due to the small size, its market reach was also limited. While there were some designer brands that would occasionally get copied by mid-priced retailers, by and large luxury brands lived in their own separate bubble, with little or no influence on the heaving mass of the market. In contrast, in the Western economies, from where many of today’s luxury brands originate, they are looked up to for inspiration. So, it is natural to expect Western luxury brands to lead the charge into the newly emerging modern retail economy of India. 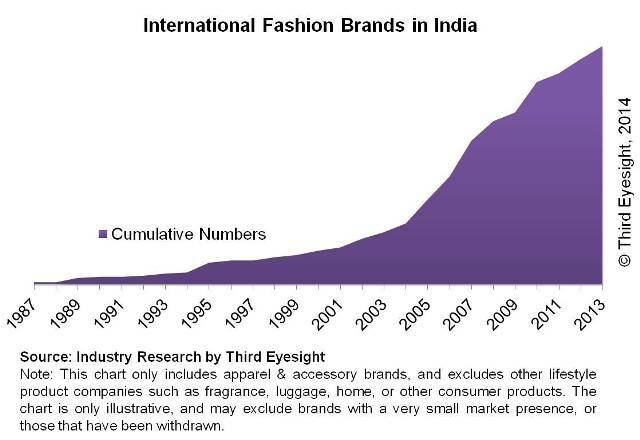 However, according to Third Eyesight’s research of international fashion and accessory brands in India, in the last 25 years it is mid-priced and premium brands that have opened the market. It is only in the last 10 years, well after the economic and retail growth was underway, that luxury brands stepped up their presence. Sure, during the so-called “retail boom” from 2004, luxury brands went up to one-quarter of all international fashion and accessory brands present in the market. Then, when practically the whole world was in a recessionary mood, and mid-priced and premium brands took a call to defer their India launch plans, luxury brands pushed ahead. 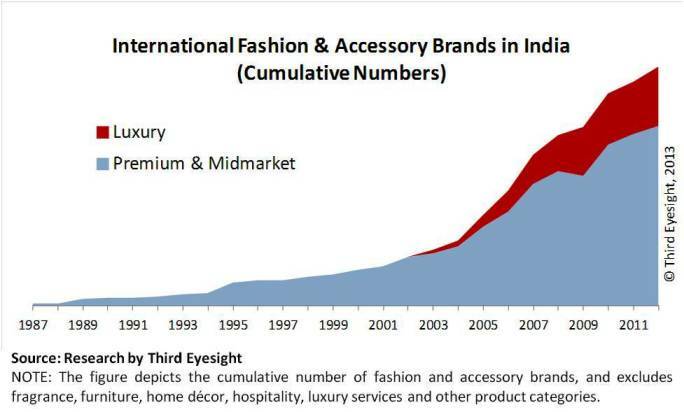 In 2009, luxury fashion brand launches accounted for two-third of all foreign fashion brands launched in India. Maybe the brand principals felt that this market could take on the burden of slowing growth elsewhere, or perhaps it was their Indian counterparts who were the source of optimism. Either way, the optimism took a hit in 2010 and 2011 when it was luxury brands that became cautious. In terms of store openings and location selection too, luxury brands seem to have waited for the overall market to upgrade itself, and have then latched on to that growth. Previously luxury brand stores, such as there were, largely restricted their presence to five-star hotel shopping arcades, while a few took up non-descript sites as they were confident of being destinations in their own right or clustered together to create a precious few bohemian locations in surroundings that were far from luxurious. As modern shopping centres emerged in recent years, these presented an environment where rich consumers — especially the ‘new’ rich — could flock to buy globally benchmarked lifestyle statements. 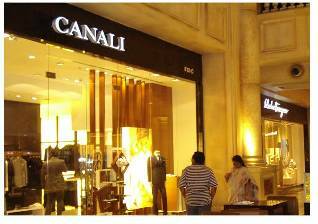 While these were mainly targeted at mid-market to premium brands, some of them are now even attracting designer brands such as Canali at Mumbai’s Palladium mall rubbing shoulders with Zara. These new luxury stores in mid-market or premium locations are performing better than the original “luxury” sites. Thus, in terms of expressing confidence in the market, luxury brands seem to be following market trends rather than leading them. And far from being the anchors to create demand, they seem to be following where the demand goes. The most important impact that luxury brands could have on the market is by influencing product design. This fashion trickle-down is supposed to work in two ways: one, through “inspiring” knock-offs by cheaper brands; two, making luxury customers act as opinion leaders and trend-setters for other consumers. However, various factors dilute the luxury brands’ product and design influence in India: the preponderance of domestic (“ethnic”) style and colour, especially in womenswear, the existing domestic variety in products, the flood of premium (non-luxury) international brands and a customer base that is oblivious to the difference between the premium and luxury segments. In spite of their small size, Indian luxury and designer brands possibly have a larger direct impact, not to mention the massive Bollywood machine that drives mainstream fashion trends on a day-to-day basis. The international luxury giants are conspicuous by their small influence. In fact, increasingly the influence is flowing the other way. A few luxury brands have attempted to create India-specific items to give the customer what they might want. Some of these may be indulging in superficial pandering such as putting an Indian image on a global product, but others have created Indian products that genuinely reflect what the brand stands for. While some use India as a production sweatshop to minimise the cost of high-skills jobs, others are now beginning to use Indian crafts to design products that are relevant to other global markets. A few examples, without passing judgement on which category they fit into, include: Lladro’s Spirit of India collection, the Hermès sari, the Jimmy Choo “Chandra” clutch bag, Louis Vuitton’s Diwali collection and Canali’s nawab jacket. Another issue with India is the sheer numbers, or the lack thereof! China’s GDP is about four times the size of India’s but its luxury market size is estimated to be six times that of India. There are 1.7 million households in China that meet the high net-worth criteria, as compared to 125,000 in India. What’s more, according to industry estimates, only about 30 per cent of luxury consumers in China are actually wealthy, while the overwhelming majority are people with mid-market incomes who are given to conspicuous consumption, whether buying luxury goods for themselves or as gifts. Indian consumers also have a penchant for buying overseas rather than shopping from the same brands’ stores in India. This is not just due to higher costs and import duties in India, but because of wider and more current selections of merchandise in stores overseas. Indians’ luxury shopping destinations include the usual suspects: London, New York, Paris, Milan, Singapore and Dubai. This has meant that while luxury brands recognise Indians as a large, emerging base of customers, for most brands India itself remains an operating market for the future. Having said that, when compared to any other sector of business, luxury brands in India probably get the most media coverage for every rupee of sales earned. Although they are a small fraction of the sales, luxury brands rule in terms of column centimetres or telecast seconds. The coverage is not restricted to consumer-oriented media such as lifestyle magazines or mainstream newspapers, individual luxury brands are also extensively covered in business media. One may argue that such is the nature of luxury: this disproportionate visibility and share of mind happen because luxury is not just aspirational, but inspirational. However, that inspiration and influence is yet to become apparent in the business at large. Until we see significantly larger numbers of upper-middle-income customers in India, luxury brands will find it difficult to expand their reach beyond the small base of ultra-rich consumers. 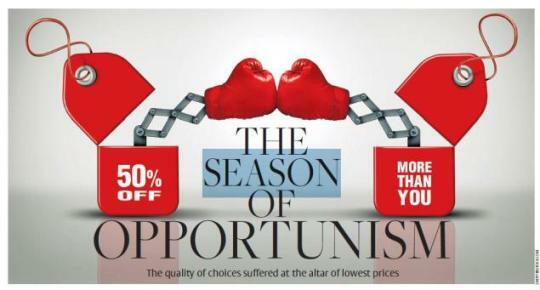 The aspiration and price gap is just too wide for the Indian middle class, and there are very few who will emulate their Chinese counterparts and save up a year’s salary for a single luxury item. One thing is beyond doubt: the luxury sector in India is undergoing significant change. We could even say it is in active ferment. There has never been so much interest among so many people, or so many brands so widely promoted, as now. The question is still open on whether it is a good ferment such as the one that produces wine from raw grape juice and fine cheese from plain curds, or the unguided rot that results in a putrid, smelly mess unfit for consumption. Since the onset of reopening of India’s economy in the late 1980s, fashion is one consumer sector that has drawn the largest number of global brands and retailers. Notwithstanding the country’s own rich heritage in textiles the market has looked up to the West for inspiration. This may be partly attributable to colonial linkages from earlier times, as well as to the pre-liberalisation years when it was fashionable to have friends and relatives overseas bring back desirable international brands when there were no equivalent Indian counterparts. Even today international fashion brands, particularly those from the USA, Europe or another Western economy, are perceived to be superior in terms of design, product quality and variety. International brands that have been drawn to India by its large “willing and able to spend” consumer base and the rapidly growing economy have benefitted in attaining quick acceptance in the Indian market and given their high desirability meter, most international brands have positioned themselves at the premium-end of the market, even if that is not the case in the home markets. 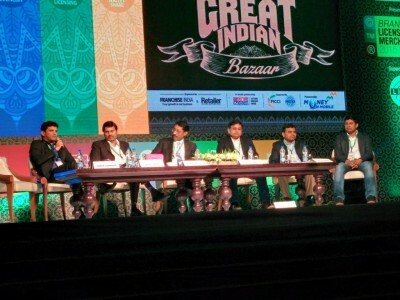 In addition, Indian companies – manufacturers or retailers – have been more than ready to act as platforms for launching these brands in the market and today there are over 200 international fashion brands in the Indian market for clothing, footwear and accessories alone, and their numbers are still growing. The rapidly growing media sector also helped the international brands in gaining visibility and establishing brand equity in the Indian market more quickly. However, this period did not see a huge rush of international brands into India. West Asia and East Asia (countries such as Japan, South Korea, Taiwan and even Thailand) were seen as more attractive due to higher incomes and better infrastructure. In the mid-1990s there was a brief upward bump in international fashion brands entering the Indian market, but by and large it was a slow and steady upward trend. 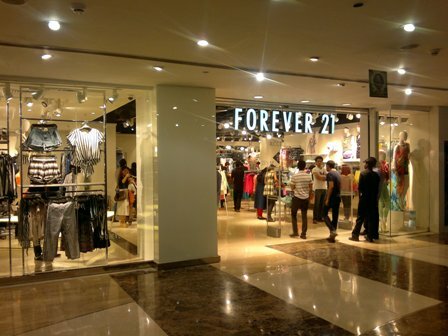 The late-1990s marked a significant milestone in the growth of modern retail in India. Higher disposable incomes and the availability of credit significantly enhanced the consumers’ buying power. Growth in good-quality retail real estate and large format department stores also allowed companies to create a more complete brand experience through exclusive brand stores in shopping centres and shop-in-shops in department stores.